The concept that eventually became Warframe has been around since 2002. The concept for Warframe existed a decade or more before Warframe’s release in 2013. It’s common for studios to harbour ideas for new games that one day—budgets willing—they will have a chance to make. Rarely do entire chunks of those ideas turn up in entirely different games, however. Before Warframe, there was Dark Sector. As a Warframe player, revisiting this 2008 cover shooter has given me a very strange case of reverse déjà-vu. Dark Sector is a game about a man called Hayden Tenno who throws a homing glaive at anonymous foes. Warframe players will have already flagged that surname: Tenno is the term for the order of mysterious ancient warriors that inhabit Warframes. That seems like an odd throwaway connection until you reach the end of the prologue and Hayden is attacked by a ninja called Nemesis who looks… familiar. Later in the game Hayden finds a high-tech suit, and basically morphs into one of Warframe’s starter suits: Excalibur. Once you've seen these fully-formed examples of Warframe's visual design, a lot of other details pop out. The hazmat-suited human enemies you fight don't look too far away from the Corpus you fight in Warframe. There's a strain of infected that rush to engage you in close combat. They are grey, shambling zombies, but not too dissimilar to Warframe's colourful infected. It's too much of a stretch to suggest that Warframe shares a universe with Dark Sector—it would be a disappointment if the mythical Tenno were actually some leather-jacketed antiheroes from a late-2000s cover shooter. The Dark Sector Digital Extremes released in 2008 was very much of its time: a Gears of War-like with gory executions and a brooding main character. It comes from a vision that was heavily altered by market requirements. This is an early pitch video from Digital Extremes, and it shows a completely different vision for Dark Sector. The space station looks like one of Warframe's relays. The enemies are obviously the Grineer. Excalibur is there, and the yellow spider robot that shows up is Jackal, the final boss of Venus. The concept goes all the way back to 2002. 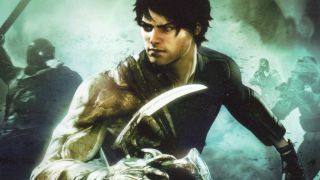 “After the Unreal games at Digital Extremes we were really looking to build our own IP," says Schmalz, "Back up in Canada right up after that, right after Unreal Championship came out, we were working on an idea called Dark Sector." The 2008 game was released during a tough time for Digital Extremes. The studio worked hard to stay afloat doing a lot of work for hire jobs developing aspects of other companies’ games. “It was a bit of a tricky problem because we still wanted to do Dark Sector and do our own products, and have this situation where we’re hopefully two teams where one is a work for hire and it’s the bread and butter, and we’re also trying to create our own IP. At that time Digital Extremes also developed Pariah, Warpath, the PS3 port of BioShock, BioShock 2's unusual multiplayer mode and Homefront's multiplayer mode. It wasn't until Warframe's 2013 release that the skintight Tenno suits made a comeback in an online free-to-play game. Today Warframe consistently ranks in Steam's top ten most played games. That old Warframe concept video hasn't been forgotten. Warframe's Lex gun looks a lot like Hayden Tenno's default pistol. Warframe's glaive can trigger one of Hayden's close combat finishers, and you can equip the Glaive Proto skin to make it look exactly like the Dark Sector weapon. On the Warframe forums user Cyborg Rox spotted a holographic projection that looks exactly like the spaceship from that early Dark Sector footage. The spirit of Hayden Tenno lives on.